When we take our scorpion to schools, parties and other places we often get a lot of people feeling frightened right away but really there is no need to be. A scorpion is a small animal with two sharp pincers at the front of their body and a long tail with poison on end. They also have eight legs just like a spider. Scorpions are predatory animals of the class Arachnida, making them cousins to spiders, mites and ticks. Scorpions eat a variety of insects, spiders, other scorpions and lizards. They also eat small mammals, such as mice. Scorpions must have water to drink, but they can survive for months without food. Scorpions use their pincers to capture and crush prey. How long does a scorpion live for? Scorpions’ have a short life of only 2-3 years. So it’s not a long term investment getting. Is a scorpion a good pet? Scorpions’ are quiet, clean and easy to care for. However, they are not best for handling. If you’re looking for a pet which gives a lot back… scorpion may not be the best for you. How do you look after a scorpion? – It’s important to have flat rocks in the habitat so that the scorpion can hide under it. Provide hiding areas using non-toxic plants, branches or logs; keep hiding areas away from the heat source. – Keep a heating mat in the habitat which keeps the temperature to 22 Celsius. Keeping it this heat makes sure you don’t dry your scorpion out or freeze it. However, make sure to maintain 60 to 80% humidity by misting as needed every day. 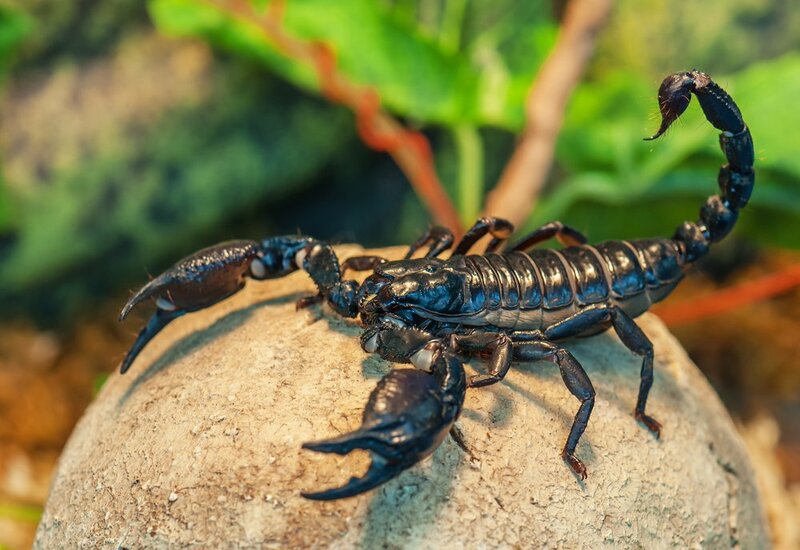 – A scorpion needs feeding twice a week, feed the scorpion crickets. Remembering to take out uneaten crickets and dead crickets an hour after feeding. -Never pick up your scorpion, the majority of scorpions are poisonous and will hurt you! Feed the scorpions using tongs and if you need to remove scorpions from their habitat corner them with a container and put a lid on. -Make sure your scorpion has a cover on so that they can’t escape but with small holes so that they can be oxygenated. -Lastly, when cleaning their tank remember never to use soap because it is poisoned for the scorpions. -Scorpions may go into hiding for a few days and refuse food before they moult. So make sure not to handle scorpions after a moult until their exoskeleton hardens. 1)Name an appearance feature of scorpion? 2)What animal class are they? 4)Where are they native to? 6)How often should you clean their cage? 7) What should you not clean their cages with? 8)Do scorpions prefer wet or dry weather? 10) If you had one as a pet, what would you call it?